Amy Julia Becker writes a beautiful blog called Thin Places. As Amy Julia states "this blog is about discovering and remembering thin places, places where heaven and earth touch, where God seems more readily present, more easily accessed. It is meant to uncover ideas, relationships, points of connection, and moments of deep beauty that draw us towards one another and towards the Holy One. Amy Julia has three young children, her middle daughter Penny has down syndrome. She is a published author and essayist. It is certainly worth your time to read her thoughtful prose. Everyday we celebrate the pure joy of Alex, our beautiful daughter, sister, granddaughter, niece, cousin, student and friend who continues to enrich our lives in unimaginable and immeasurable ways. Her very existence has given us the power to become better people and more empathetic community members. We have met tremendous children with special needs and their families, as well as scores of remarkable adults with special needs. We have had the good fortune to work with caring and skilled professionals because of Alex. We celebrate her life as a gift and privilege to so many people in so many ways. Alex teaches us not to sweat the small stuff, to take our lives one day at a time, all the while enjoying the present and the passage of time. Of course there are challenges in Alex’s life as well as ours, but we do our best to pick the moment each day that is worthy of a celebration instead of cursing the darker ones. We never have to look too far to find a lesson learned through or from Alex. And in that, we delight. Families of special kids learn early on that their children don’t rush through life. Alex is no exception, her lack of urgency in everything has been apparent her whole life. She takes longer to get ready in the morning, longer with her meals, and her showers last forever. She enjoys picking out her clothes, savoring her food and the feeling of warm water on her body. She follows a simple philosophy: Why rush? We make adjustments for Alex and give her extra time, but sometimes it’s still not enough. It doesn’t matter how long we give her because she always chugs along at her own speed. We call this “Stop and Smell the Roses” Syndrome. While we have frustrating moments trying to get Alex to move along at our speed, we’ve also learned to celebrate the journey of life along the way. She has literally reminded us that roses are worth stopping for; we admire their beauty and smell their sweet perfume. Her speed can either elevate or alleviate our stress levels; it’s up to us which way it’ll go at any given moment. No one wants to be late, but how worth it is it to get stressed out over a delayed minute here and there? Sometimes it’s fun to admire a cute baby passing by in a stroller for an extra moment, or spend a few more minutes giggling at the comics in the paper. We celebrate that reminder. Alex is also the one who wants family game night. She cherishes whatever moments we can all spend together, and supports us in our individual pursuits as much as we do in hers. She’s in the front row at each of her sister’s plays, bundled up on the slopes for all of her brother’s snowboard competitions, her face beaming with pride each and every time. She begs John for special father-daughter time, and relishes being with him, no matter the activity. And even though I can’t imagine anything more tedious, she even comes to every one of my tennis matches, celebrating my winning points as well as those of my opponents. Alex doesn’t rush through life, nor does she waste a moment. She’s the most magical, loyal and truest person I know. Alex’s hugs or the bestowal of her beautiful smile brighten my days and my heart. She is the sunshine in our lives — mine, John’s, Courtney’s and Tom’s. In many ways, I feel like the guardian of this extraordinary individual, the steward of her life, the protector of her magic. Every day I thank the universe for giving us Alex. I don’t know why we’ve been so lucky, but I do know she has taught me an extraordinary lesson that I am obligated to celebrate and share. Perhaps I’m a Pollyanna, and if so, I am grateful. I strive every day to make the world a better place for my family and all children with special needs. 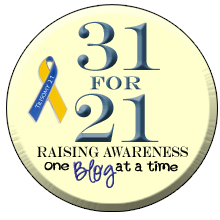 The process to get where I am today might have been through baby steps, and my ability to bring our lessons to others through even tinier steps, but I believe I have and can continue to make a difference to so many others through telling Alex’s story. There really is a lesson of celebration in this for every one of us. Margaret (Gary) Bender is the mother of three children. Her middle daughter Alex (17) has Down syndrome. Her passion is to create a better life for Alex and all her peers. This post is excerpted from Gary’s first book. 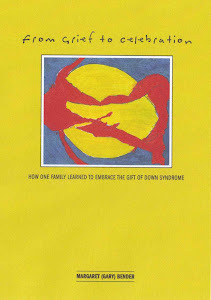 “From Grief to Celebration, How One Family Learned to Embrace the Unexpected Gift of Down Syndrome.” She blogs at http://downsyndrometeenager.blogspot.com/ where you can also purchase a copy of her book. Thank you so much Amy Julia. To celebrate Alex I have reduced the price of my book from $13.99 plus taxes to $12.50 all inclusive for the months of April and May! I hope you all celebrate and embrace your journey today.